A great piece of furniture for use both in and outdoors! This champagne wire cage side table sits at 540mm tall & is a totally unique style of furniture. Made from metal with a natural cork (Portuguese) top, the top has a transparent water base paint to block any unfortunate spillages. All wire cages are made by hand and each one is therefore slightly different. Care needs to be taken as paint may scratch easily. This item is a side table, therefore we recommend that it should not to be sat on. I have just received the XL Champagne Cork Wire Cage side table. It's fantastic! It's bigger than I thought it would be and it's very solid. It's really different and looks great in the family room/dining area of my kitchen. The order and delivery process went really smoothly. All in all an excellent service all round! Mrs C Hughes. 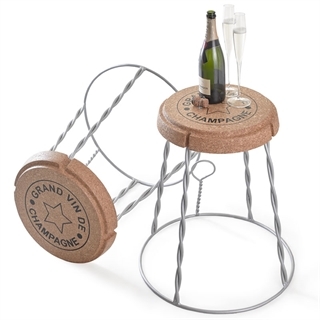 I had swopped this for the cork champagne stool and it arrived quickly. The stool is fabulous however the black printing on top of the stool is not very sturdy at all. It is already starting to come off and at this rate I dont now how long it will be until the writing is illegible.